Investors have heard the same call to action many times in the past. Expert analysts point out that there is one part of the world’s economy that is growing most rapidly and likely to outperform the United States and other developed markets. They urge investors to consider emerging markets. The long-term chart below shows that the iShares MSCI Emerging markets ETF (NYSE: EEM) is near the same level it peaked at in 2007, and has consistently traded below that high for years. One of the keys to success in the markets is buying low, so the question becomes is now the ideal time to buy into EEM or to implement other emerging market strategies? Ruchir Sharma, chief global strategist and head of emerging markets at Morgan Stanley Investment Management, was recently featured in Barron’s. Sharma oversees the management of $20 billion for the large investment firm. Barron’s notes that Sharma “cautioned investors at the start of the decade to avoid the overhyped BRICs—markets in Brazil, Russia, India, and China—and recommended that they look more favorably on U.S. stocks, particularly technology shares. They have been volatile and enjoyed some large bull market gains and some distressingly large bear market losses. Sharma noted, “This has been a lost decade for emerging markets, from the beginning of 2010 through the end of last year. Meanwhile, the U.S. market has tripled. That is a complete reversal from the prior decade. The U.S. is at all-time highs relative to the rest of the world in terms of trailing price/earnings ratios—levels that historically led to a mean reversion. The U.S. dollar, which has been an important driver of these relative trends, seems to be peaking. It is at the higher end of its range in the post–Bretton Woods era [when the dollar was pegged to the price of gold, which ended in 1972]. The interest-rate differential between the U.S. and the rest of the world is also near an all-time high. We are close to an inflection point in markets. The performance gap between the U.S. and the rest of the world is bound to narrow in the coming decade. The U.S. today is about 55% of the global market cap, and its share of the global economy is 25%. The last time such a large gap existed was in the late 1980s, when the Japanese market was 45% of the global market cap and Japan’s economy was about 15% of the world total. That didn’t turn out so well for Japan.” The next chart highlights exactly what that means for investors. It’s a chart of the Japanese benchmark Nikkei 225 Index. Sharma offered a number of specific ideas investors can consider. “Consumer-staples companies in emerging markets are trading at the lowest levels I have ever seen relative to broader emerging markets. Our portfolio managers like Fomento Economico Mexicano [ticker: FMX], or Femsa; Portugal’s Jerónimo Martins [JMT.Portugal]; Ambev [ABEV]; Wal-Mart de Mexico [WALMEX.Mexico]; and Russia’s X5 Retail Group [FIVE.UK]. Our China portfolio includes education stocks such as New Oriental Education & Technology Group [EDU], consumer stocks like China Mengniu Dairy [2319.Hong Kong] and Kweichow Moutai [600519.China], and pharmaceutical stocks like CSPC Pharmaceutical Group [1093.Hong Kong]. India tops the list of countries where we can get companies with stable earnings growth. It has the most compounders, like HDFC Bank [HDB], which we have held since its initial public offering in 1995, and car makers such as Maruti Suzuki India [MSIL.India]. The risks identified with stocks in India should be considered and it should be noted that all of these stocks carry risks unique to their home countries and countries they operate in, even the shares that are available on US exchanges carry these “home country” risks. As you know, risks should always be considered when considering any potential investment opportunity. “For the 592nd time, it looks like emerging markets are set to rally. By far and away, the most frustrating investment, trade, thesis has been betting on anything but US equities, and particularly positioning long into emerging markets. No words can describe that degree of frustration. Doing a simple back test of various popular technical trading indicators would have resulted in tremendous whipsaws over the last 10 years, and cheap valuation simply hasn’t translated into price momentum. Anyone who has included emerging markets in their portfolio has arguably suffered in terms of overall performance, and anyone who has traded them wishes they were never a part of their opportunity set. At some point (hopefully in my lifetime), the secular trend of frustration will end and emerging markets will have a cycle that favors them. Maybe it finally has started. 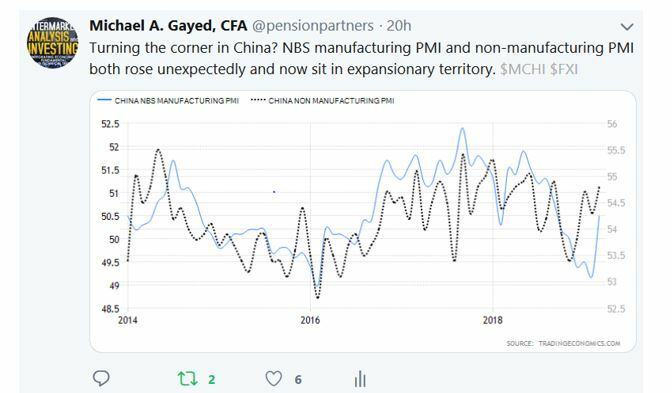 A lot of technicians will note several key breakouts from what looks like a classic U-shape appearing in emerging market indices, and economists will note that manufacturing and non-manufacturing PMI in China is picking up in the near-term. This could be the time to buy emerging markets and EEM offers a diversified investment in that market for relatively conservative investors to gain broad exposure to the asset class.